Every runner knows that having a strong center can help you run faster. What isn’t clear is what core exercises are best for building the stability and strength that best supports running at any distance. While your core is made up of many muscles this blog’s focus is on the core’s core. Made up of your abs, obliques, lower back and transverse abdominis they’re the muscles that keep you aligned and upright. That’s pretty important stuff for running. 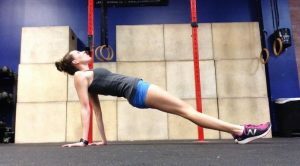 Whether you’re an 800M runner or an ultra marathoner here are are three of Team ECRP‘s favorite core exercises. Trust us, they’re so much fun you’ll want to add them to your strength training routine as soon as you can. Planks. Runners can never plank enough. Well, a world record isn’t necessary. With so many varieties available there is a plank for everyone. One great tool for continuing to challenge your body to get stronger is plank flash cards. Write a type of plank on one side of a card, repeat for a number of styles then record your history on each one. Twists. Rotational stability is key for not wasting energy while we run. The more power going forward the better off we are. Strengthening our twisting muscles provides the support we need to run faster and more efficiently. You can twist in a plank and with a ball, cable or resistance band. Whichever one you choose is sure to benefit you. Dead bugs. More like a dying bug since you’re moving but this simple looking move can really be tough. This move exclusively hits that all important transverse adominis. Right in the middle of your body this muscle is the center of your core providing stability for your spine and pelvic floor. Laying on your back it’s important to keep your lower supported and move your legs independently. With so many core exercises to choose from it’s hard to go wrong. Give the choices about a try to develop a well rounded core that will support every mile you run and those last few marathon miles will thank you. This entry was posted in Racing, Running, Strength Training and tagged core strength, plank, running, strength, strength training, yoga on July 23, 2018 by Coach Meredith.